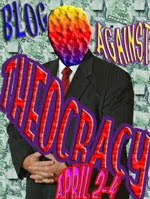 This weekend, April 2-4, is the Blog Against Theocracy blogswarm. Go to Blue Gal or Tengrain's place for more information. You can click on the badge on my sidebar, to the right, for instructions on how to participate. 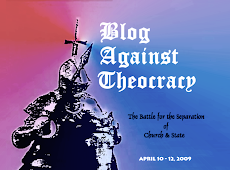 The purpose of the blogswarm is to write anything at all about why there must be a separation of church and state in this country. I'm sure most of us, whether religious or not, can understand why it is best to keep religion out of government, if you want to keep government out of religion. Will look forward to reading the many insightful posts that I expect will be written on this subject! Baxter here. Many Apologies, over a Week has passed since the last Post here. My Female Human has been busily making Arrangements for her Mother, who came home from the Nursing Home yesterday. My Human's Mother is Very Happy to be back in her Own Apartment and seems to be doing Very Well, considering her Age and Condition. A Nurse's Aide comes in to watch her at Night, and during the Day my Female Human will be there helping her. All this is All Very Well, and I have Nothing against the Female Human's Mother. But for Me it is NOT an improvement. I was just getting used to having more Company around Here, and whenever That Dog was out in the Yard or Asleep I got to cuddle up on the Couch with my Human. Now she is gone All Day again just as she was in the Old Days when she did what she called "Working." From what I understand, she says what she is doing NOW is Work too! That Dog is probably not Happy either. She is stuck in the House. However, at 4 p.m. the Female Human's Aunt comes down to her Mother's Apartment and sits there while my Human comes home and walks That Dog. Still no help for Me, but what can you do. But I digress! You don't come here to hear about my Female Human's Personal Issues. You expect More from an intelligent Feline like Myself. So without Further Ado I will launch into my usual News Summary. 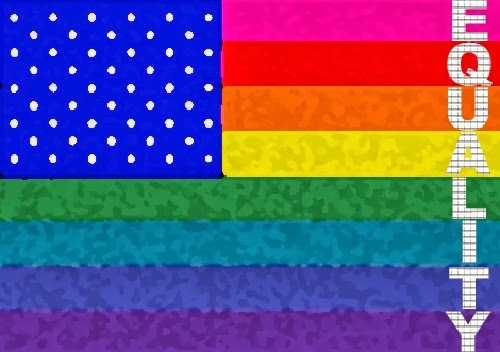 Of course, the Big News is the Passage of the Landmark Healthcare Legislation. Or Historic Healthcare Legislation, however you want to put it. As Most of You are already Well Aware, on Sunday night the House passed the Senate Health Care bill that had already passed before the New Year. They then went ahead and passed a bunch of amendments to it, which the Senate then had to Approve. And, with a few changes, they did. The last step was that the House then approved the slightly changed Reconciliation Bill that will put those amendments into Effect. The Best Moment before President Obama spoke at the Signing Ceremony was when Vice President Biden uttered the Now-Famous Phrase, "This is a Big F*cking Deal" in the President's ear just before he turned the mic over to him. T-shirts are being sold as we speak. Right Now my Ears are twitching and my Whiskers are bristling, however, because MSNBC is televising the speech Sarah Palin is making at a big Rally for John McCain. I must say, that Woman's voice goes right through Me! "Send the Maverick back to the Senate!" she says. Ugh. In return, OctoMom gets $5000 a month and some veggie burgers and dogs to feed her "Litter." No, I am not being Crass. The word "litter" was on PETA's BLOG for Heaven's Sakes, with a line drawn through it. Go see for yourself. The story does have a Happy Ending because the Dog is just under probation and the Owner is to get him Obedience training to get his Canine Good Citizen certification. As for the damage to the Squad Car: I would be Concerned, if I were the Police, that their Squad Cars are so fragile the front bumper can be totally removed by a Dog! Shouldn't vehicles be a little more Sturdy than THAT? 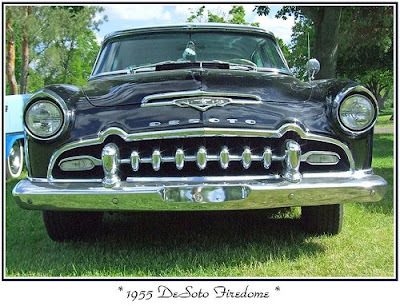 I'll bet the Dog wouldn't have made a dent in my Humans' old 1955 DeSoto that they used to have! That was when Cars were Cars and were Meant to Last! Speaking of Cars, there is Good News out of Trollhattan, the location of the Swedish Headquarters of the new Saab-Spyker company. They have started shipping their first Batch of New Cars under the new Ownership! Plus, they're cutting Prices! It just might be time for a New Car for my Humans. We'll see if they are Tempted. So, that is the News for this Week. I know I haven't covered Every News Item but these were the Things I wanted to share with You personally. Until Next Time, hang in there, try to ignore the Republicans, and keep your Catnip at the Ready! Dennis Kucinich announced today at a press conference that he would support the health care legislation when it comes to a vote. "In the past week it has become clear that the vote on the final health care bill will be very close. I take this vote with the utmost seriousness. I am quite aware of the historic fight that has lasted the better part of the last century to bring America in line with other modern democracies in providing single payer health care. I have seen the political pressure and the financial pressure being asserted to prevent a minimal recognition of this right, even within the context of a system dominated by private insurance companies. This fear has so infected our politics, our economics and our international relations that as a nation we are losing sight of the expanded vision, the electrifying potential we caught a glimpse of with the election of Barack Obama. The transformational potential of his presidency, and of ourselves, can still be courageously summoned in ways that will reconnect America to our hopes for expanded opportunities for jobs, housing, education, peace, and yes, health care." Thank you, Dennis. I know it wasn't easy for you to give up your ideals in order to vote for something you cannot fully support. Some may say you have caved to pressure, others may say you have sold out. But I say you have done the right thing, the only thing you could do, in order to make sure more Americans receive the health care they deserve. It is not the end of the fight; it is only the beginning. President Obama has been storming the countryside trying to round up support for the health care legislation he is championing. Simultaneously, the GOP and their minions have been spreading their own propaganda explaining why health care legislation should not be passed. 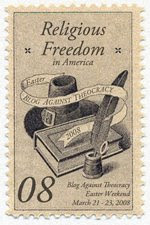 The legislation itself is not ideal, and is being attacked from both the right and the left. It doesn't go far enough for the left (hence Dennis Kucinich says he will not vote for it), and for the right, anything is too far. Uninsured people use the Emergency Rooms of hospitals for their medical care, which is more expensive. Thus, the idea goes, if everyone had health care, costs would decrease since there would be fewer people accessing the ER for their primary care. "A study by the Robert Wood Johnson Foundation found that the insured accounted for 83 percent of emergency-room visits, reflecting their share of the population. After Massachusetts adopted universal insurance, emergency-room use remained higher than the national average, an Urban Institute study found. More than two-fifths of visits represented non-emergencies. Of those, a majority of adult respondents to a survey said it was 'more convenient' to go to the emergency room or they couldn't 'get [a doctor's] appointment as soon as needed.' If universal coverage makes appointments harder to get, emergency-room use may increase." "How could this be? No one knows, but possible explanations include: (a) many uninsured are fairly healthy -- about two-fifths are age 18 to 34; (b) some are too sick to be helped or have problems rooted in personal behaviors -- smoking, diet, drinking or drug abuse; and (c) the uninsured already receive 50 to 70 percent of the care of the insured from hospitals, clinics and doctors, estimates the Congressional Budget Office." "He's telling people what they want to hear, not what they need to know. Whatever their sins, insurers are mainly intermediaries; they pass along the costs of the delivery system. In 2009, the largest 14 insurers had profits of roughly $9 billion; that approached 0.4 percent of total health spending of $2.472 trillion. This hardly explains high health costs. What people need to know is that Obama's plan evades health care's major problems and would worsen the budget outlook. It's a big new spending program when government hasn't paid for the spending programs it already has." Of course, the fallacy of his conclusion is that "Insurers are mainly intermediaries; they pass along the costs of the delivery system." No, the main problem with the insurers is they are geared toward making a profit, and they try to get out of covering anyone who really needs the insurance, such as, say, sick people. Maybe profit isn't that large a percentage of overall health care costs, but it is certainly the motivating factor behind insurance company policies which result in sick people being unable to become insured, or if insured, not being covered for their illnesses. The other problem with the insurance industry when there isn't universal coverage is, that people who have the insurance get a much CHEAPER rate than those who don't. So uninsured people are hit from two sides: One, they have to pay out of their own pockets for medical care, and two: their medical care is much more expensive than that of people with insurance. If anyone can show me this is not true, I welcome it. But I've seen my bills from medical procedures. They show one, very high, price, then the "adjusted" price accepted by the doctor from my insurance, and then what my insurance pays, leaving a small amount for me to pay. I can only assume the uninsured pay the first price. If everyone were insured, there would be only the "adjusted" price. And that alone would be a vast improvement. OK, so where does that leave us with President Obama's arguments in favor of health care? Is he really lying to us and not telling us "what we need to know"? No. He is giving the arguments that will pass muster with the portion of the population who have drunk the Kool-Aid of the right wing and think the main problem is they will lose something in this bargain. They will get screwed somehow if their uninsured neighbor manages to get the same benefits they have. They will have to pay more. They will lose something they had. It's all about them. So to reach those people, he has to give them cost-related, "them"-related arguments. The rest know that health care for all is the right thing to do and don't care as much about those arguments. Think I'm being unkind to those opposed to the health care legislation on the right? Check out Nick Silver's post on fivethirtyeight.com on the two sides of the health care debate. In his post he analyzes the results of a recent Gallup poll that included the verbatims (what people actually said, for those who don't know market research-speak) from the survey. The results showed that the nation is almost equally divided on the current legislation, with a slight tip against the bill, 48% to 45%. Among those who support the legislation, 29% say it is because "people need health insurance/too many are uninsured." In addition, 12% said it is "a moral responsibility." 12% also felt it would reduce costs and 10% said it would make health insurance more affordable. Several key reasons included the word "help" as in, "help senior citizens," "help the poor," and that they or a family member lacked insurance. Among those against the legislation, the top reason was it would increase costs of insurance (20%) and another 5% said it would cost the government too much. 15% were opposed to government involvement in health care or "big government" in general. 7% mentioned being against "socialized medicine" -- even though Obama's plan is not socialized medicine -- or the "public option," even though the public option is not currently in the bill. 6% said that health care is a privilege, not an entitlement and 4% were worried it would affect their own insurance. To be sure, some of the pro-health care people are concerned about costs and are thinking this would be a way to reduce them, and if this isn't true, they have perhaps been misled. However, that does not seem to be the most important issue to them. When you look at the verbatims themselves, the pattern is more noticeable. FiveThirtyEight.com provided "word clouds" showing the prevalence of certain words in the actual comments the respondents made to the survey. Pro-Health Care respondents focused mostly on words like "People," "Need," "Everyone" "Insurance." Anti-Health Care respondents, in contrast, focused much more on words such as "Government," "Pay," and "Cost," as well as "People" and "Insurance." "THE HEALTHCARE SYSTEM IN OUR COUNTRY IS AN ABOMINATION. BECAUSE THE GREATEST COUNTRY IN THE WORLD HAS A DISMAL HEALTHCARE SYSTEM. HEALTHCARE IS A RIGHT, NOT A PRIVILEGE. BECAUSE THIS COUNTRY IS TERRIBLE FOR US. THE BIGGEST COUNTRY IN THE WORLD NOT TO HAVE HEALTHCARE FOR THEIR PEOPLE. I'M SET BUT MY CHILDREN WON'T BE. THEY NEED TO GIVE IT A START. I THINK WE ARE IN A FIRST-WORLD COUNTRY THAT SHOULD HAVE HEALTHCARE INSURANCE. I AM FORTUNATE TO HAVE INSURANCE BUT I DON'T KNOW HOW OTHER PEOPLE MAKE IT WHO DO NOT HAVE INSURANCE. MEDICARE DOESN'T COVER EVERYTHING. MEDICARE ONLY PAYS 80 PERCENT AND SOMEONE HAS TO PAY THE DIFFERENCE. IT'S OUR BASIC DUTY TO PROVIDE HEALTHCARE FOR THE POOR AND ELDERLY. SO PEOPLE CAN GET HELP. BECAUSE I THINK IT'S NEEDED TO CHANGE TO SAVE MONEY FOR SOME PEOPLE THAT DON'T HAVE IT BECAUSE EVERYBODY SHOULD HAVE HEALTHCARE. I DON'T THINK IT'S FAIR FOR PEOPLE TO BE WITHOUT HEALTHCARE COVERAGE. BECAUSE I FEEL EVERYONE SHOULD HAVE ACCESS TO HEALTHCARE REGARDLESS OF INCOME, EMPLOYMENT, AND WHERE THEY LIVE." "I BELIEVE IT'S GOING TO SCREW EVERYTHING UP WITH THE GOVERNMENT GETTING INVOLVED. YOU WON'T BE ABLE TO GET THE CARE YOU NEED. PEOPLE WILL BE TURNED AWAY. I FEEL THAT THEY ARE TRYING TO LEAN TOWARDS WHAT EUROPEAN COUNTRIES. NONE OF IT WORKED. ALL FAILED. EVERYBODY THAT'S TRIED HAS FAILED. IT WILL HURT ME. I'M DIABETIC AND IT WOULD PUSH ME INTO SOMETHING. I HAVE A DOCTOR WHO TAKES CARE OF ME. IF THEY GO WITH THE REFORM, I CAN'T CHOOSE MY DOCTOR. GOVERNMENT TAKEOVER AND INCREASED DEBT. IT WILL BE SOCIALIZED MEDICINE. THE COST TO ME, AND THAT PEOPLE WHO CHOOSE TO HAVE UNHEALTHY LIFESTYLES, LIKE DOING DRUGS AND SMOKING, I SHOULDN'T HAVE TO PAY FOR. I DON'T THINK PEOPLE SHOULD GET THINGS FOR NOTHING. I DON'T WANNA HAVE TO PAY FOR SOMEONE ELSE'S HEALTHCARE, THAT'S WHAT WELFARE IS FOR. I CHOSE A CAREER THAT PAYS FOR MY HEALTHCARE. I THINK EVERYONE SHOULD WORK AND SUPPLY THEIR OWN INSURANCE. BECAUSE I DON'T WANNA HAVE MONEY TAKEN OUT OF MY CHECK TO PAY FOR PEOPLE WHO WON'T WORK"
Yes, I cherrypicked these comments. However, let me be clear, the "Pro" people had no verbatims that talked about "I don't want to pay for someone else" or "I don't want to pay for people who won't work." If you want to look at the entire list, please go to FiveThirtyEight.com and click on "verbatim responses" in the first paragraph. I felt this was a very telling survey result, and an example of how looking at the verbatims can really take you behind the numbers and understand the mindset of the people responding to the survey. It is obvious that the "Anti" respondents are highly influenced by the right-wing talking points and have a much more egocentric outlook on the subject. The "Pro" respondents, while still concerned about costs in general, appear to be much more altruistic in their outlooks and talk much more about helping others. So is it any wonder that, in order to convince people who are not currently on the health care bandwagon to support his initiative, President Obama has to appeal to the cost side of the equation and not the altruism side? In reality, I don't know whether expanding health care coverage to the uninsured will increase or decrease overall costs. I think it remains to be seen. But that is not the real reason we should be increasing coverage of the uninsured. It's just the right thing to do. "THEY GOTTA MAKE ONE STEP AND THEN ANOTHER AND THEN ADJUST IT IF YOU NEED TO, BUT YOU CAN'T SIT ON YOUR THUMBS AND DO NOTHING." Dennis Kucinich, I love you and think you are ideologically pure. But opposing this bill will not be helpful. The result, if it fails, is that nothing at all will be done; and in addition, President Obama will have a very difficult time getting anything else accomplished. The Republicans will feel they have won and have the upper hand. And that would be a disaster. I'm not saying the bill is perfect as it is, far from it. But it will help insure more people, and will accomplish part of what needs to be done. Rome is never built in a day. This endless winter seems to be finally nearing its end. We've had several beautiful almost-spring days in a row; even today, which was supposed to be drizzly, has been relatively pleasant. At last, birds are singing in the morning, and the Mockingbird and his mate have apparently staked out their territory. I saw him sitting on a high wire pouring out his usual torrent of mixed-up birdsong, effortlessly moving from the Cardinal to the Robin's song, followed by a few scraps of other birds' songs that weren't quite recognizable. The Mockingbird is the only bird I know of in this area that actually sings in the middle of the night. I've often heard him at 1 or 2 a.m. during the breeding season. Another morning when we were walking the dog we heard, far overhead, the sounds of Canada Geese honking. No, they weren't the usual non-migrating New Jersey geese just going from one office park to another. These were serious geese. There were two big long lines of them, high above, which gradually managed to come together and start forming the requisite V. They were clearly headed north and in it for the long haul. The snow has all melted except for a few lumps here and there where the plows had piled it up; now it has changed into that crunchy icy stuff, flecked with black. (I always wonder where the black comes from. The road? The air? The snow itself?). I've seen buds on one or two of the early shrubs and trees. We even managed to sit outside on our deck on a couple of afternoons when the temperatures hovered around 60 degrees. But the grass is still brown and the trees are still bare and the next four days are supposed to be chilly and rainy. We are still stuck in the house. That is one form of "cabin fever" from which we are suffering. The other form of cabin fever we have is that urge to get away from it all and go to our cabin in the Adirondacks. Unfortunately spring up there is 2-3 weeks behind New Jersey. I'm sure there is still plenty of snow on the ground and it will still be cold enough at night to freeze pipes for a few weeks yet, so we are still stuck in New Jersey for another month or so. In the meantime, my days are filled with errands and visits to my mother in the nursing home, where she is still getting rehabilitation. It's amazing how the days fly by when they are all so similar. Unfortunately, my mother seems to be developing dementia as time goes by. At first I thought it was due to her lung condition, but as it turns out her blood gas levels are all normal, so it isn't due to that. Interestingly, I just read an article about nicotine containing compounds that may actually be beneficial in preventing or mitigating Alzheimer's Disease. There are a number of recent studies that back up this possible connection, although of course it is far from a cure. My mother, a lifelong smoker, smoked until she went into the hospital. She has now been nicotine-free for over a month and her congition has declined markedly. I realize it could be the result of her recent illness, stress, or hospitalization, but I am wondering if she would have done better if she'd had the nicotine patch as she did the last time she was hospitalized. I wish I had asked for it, in retrospect. Hindsight is always 20-20, as the saying goes. I hope to talk to the doctor about her condition and see if Aricept or another drug might have the same beneficial effects without her having to go on the nicotine patch. Of course, I know that it may be too late to bring her back to the way she was, and I may need to accept that and just enjoy the time we have left together in whatever condition she may be in. Thinking of the migrating birds, and my mother's long life, now closing in on its end, reminds me of the Sandy Denny song, "Who Knows Where the Time Goes." I first knew this song as it was sung by Judy Collins, and her bell-like voice is just unmatched by anyone. So I will post a video of her singing the song in concert in 2000. Looking for some classy insults? If you are looking for a way to insult someone - say, a Tea Bagger - and you want some inspiration, look no further than this great collection of witty insults. Someone sent this via e-mail and I thought they were amusing enough to share. Certainly beats the incivility of the Rush Limbaughs of the world. She said, "If you were my husband I'd poison your tea." Great song by the Austin Lounge Lizards. "Yo Ho, Go Ahead and Die!" They pretty much sum up the attitude of the health insurance companies and the GOP. You must go to this link and watch the singing/howling dogs that were featured on Rachel Maddow's show tonight. There are additional clips that weren't shown on her show. They are all well worth watching - you'll howl with delight. It was particularly interesting to me that more than one dog howled when hearing the theme song for Empire Carpets - and one responded to the Colbert Report's theme song! Interestingly, our dog Diva slept through the entire panoply of howling dogs. Apparently howling means nothing to a pit bull terrier. Baxter, on the other hand, was seriously freaked out and after looking around in horror, had to leave the room.